Big Finish kicks off the fortieth anniversary year by inviting back writer Robert Shearman- author of two of the very best audios so far in ‘The Holy Terror’ and ‘Chimes of Midnight’- to pen a Dalek tale. The result is another masterpiece that continues to showcase how superb the realization of imagination and drama can be in the audio medium. Events here take place on an alternate Earth in 2003, a fascist state that the Doctor inadvertently created by defeating the Daleks a century ago. Here, the Daleks are ridiculed and marketed in popular culture, the Doctor portrayed on screen as a dashing figure and Evelyn as his love interest. In this Glorious English Empire that has risen to lofty power in the world thanks to Dalek technology remnants, command and discipline are strict, and even the use of contractions in language is strictly forbidden. The parallels to the Dalek culture are obvious- commenting on the folly of not learning from the past- and the madness of the situation is perfectly portrayed by the President Nigel Rochester and wife Miriam, played by Martin Jarvis and Rosalind Ayres, respectively. Rochester mutilating people from around the world and fitting them into Dalek casings for his own personal amusement speaks for itself. 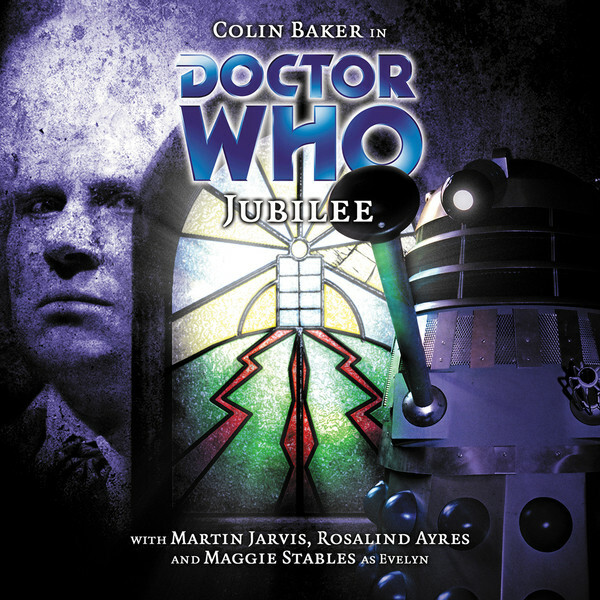 Quite interestingly, ‘Jubilee’ features a lone Dalek in chains, one that has been scorned and tortured for a century in the Tower of London, unable to kill others or itself as it is left to sit and dwell on its continued existence and giving Evelyn good reason to question if a Dalek can ever become good. This is very much a tale of parallels, and though the parallels between the Doctor and the Dalek race as a whole are well-trodden territory, ‘Jubilee’ takes comparisons in a slightly different direction by comparing the lone Dalek to Evelyn and the Doctor’s companions, claiming that each acts only while obeying orders, whether that be from the Dalek command or from the Doctor. This is a fascinating spin and certainly sheds new light on assumed perceptions. The scenes featuring the torture of the Dalek are actually quite horrific and likely could not be shown on television even though the Dalek casing is anything but humanoid. The fact that the Dalek is boiled within its casing, only for the resulting liquid to be bottled and sold as a delicacy is disturbing enough; the threats of slicing its optic nerve so that every second of sight would be agonizing is beyond reproach and sadly speaks volumes about how evil humans can be given what they perceive to be motivation. There’s another creature held hostage within the Tower who is tortured just as badly, however, and though the script does a good job in misdirecting listeners into believing it is Davros, it is eventually made apparent that this is the Sixth Doctor from the original timeline before divergence. His repeated escape attempts have resulted in the guards cutting off his legs, confining him to a wheelchair as punishment. There’s quite a bit of humour to be had in the way events are portrayed at the beginning of the story, and the opening movie trailer and Dalek song are particular highlights, but that humour quickly gives way to the more serious notions, especially as the oncoming Dalek threat increases. ‘Jubilee’ proves itself to be a Doctor Who story of the highest magnitude, showcasing superb acting and superb directing while managing to make the Daleks a truly evil presence once again. The final episode is a bit rushed compared to the preceding three due to the sheer amount of material it has to get through, but the message it has to tell about remembering and honouring the past and the means by which it delivers it more than makes up for the difference in pacing. The alternate timeline plot thread and dual character versions inherently has the potential to become overbearing and confusing, but Shearman avoids this pitfall and manages to keep everything as streamlined and straightforward as possible in order to make his story satisfying to both casual listeners and fans alike.